We are not the oldest…. Our claim to fame is we have been open every year for over 180 years. (This had to be interesting flour). In 1869 the mill burns and a new larger building is built as a grist mill only. 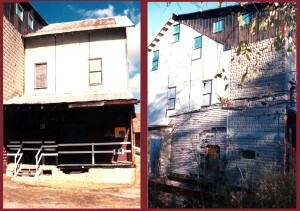 The building was electrified and it ran as a feed mill until 1969. 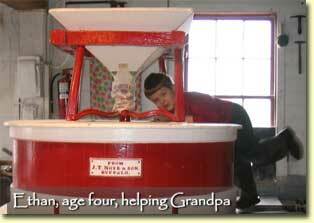 In 1970 a set of 48 inch French Buhr Stones were installed and it started operating as a grist mill once again. The stones weigh over 2000 lbs and are estimated to be 200 years old. Come and watch as the massive stones gently grind the wheat into flour and the corn into meal. Feel the vibration in the floor as they do their work. Learn how one of the world’s first automated factories was operated. If you are lucky the miller might have the time to take you on a tour of the mill where you will see…. This mill is family owned and not in excellent shape. We are approaching “good shape” at this time. When we bought this property in 1995 there was almost no glass in the windows, big holes in the roof and the termites had eaten up nearly ¼ of the lower floors. It took three years to save the mill before we could start the restoration. safe and sound and we are producing over 40 products that we are very proud of. They are stone ground 100% natural. The small town of Bridgeton, Indiana has 27 buildings in a National Historic District. I like to say it is five miles from civilization. There are no busy roads or noisy industries. Just the lazy Big Raccoon Creek flowing under Indiana’s Most Famous Covered Bridge and crashing over the waterfall next to the Historic Bridgeton Mill. 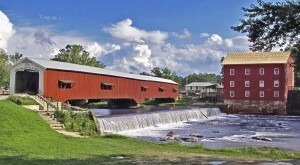 Stay awhile and see the other 30 covered bridges and another old mill in the county.